The world of Star Wars was aflutter recently with drama about the future of Star Wars movie spinoffs that maybe-don’t-but-actually-do-oh-who-knows-anymore exist. But amid all that, one rumour of great interest focused on alleged plans for a spinoff film set in Mos Eisley Spaceport. It sounds silly, but it could’ve been a great idea. Let me be clear: It never should’ve been a movie. People didn’t exactly turn out too strongly for a movie about one of Star Wars’ most beloved characters, so they’re probably not going to light up the box office for a movie about a specific location in the galaxy far, far away, and a relatively minor one like Mos Eisley Spaceport, at that. If the movie actually existed at all — it’s only been the subject of rumours, and those rumours were specifically about it not existing now anyway — it’s an idea that would’ve been much better as an anthology TV series. We know Lucasfilm is working on a few ideas for Disney’s streaming service, too! But it should have been an anthology for another reason: It should be basically have been a TV adaptation of the 1995 book Tales from the Mos Eisley Cantina. 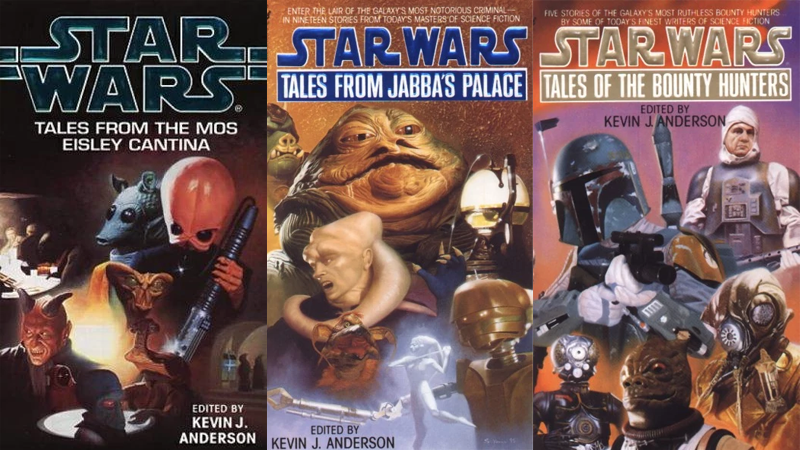 Edited by Kevin J. Anderson and filled with stories from EU luminaries like Timothy Zahn, Tom Veitch, Barbara Hambly, and more, Tales and its spiritual successors (Tales from Jabba’s Palace and Tales of the Bounty Hunters) were some of my all-time favourite Star Wars books growing up as a kid. Using the framing device of familiar locales and scenarios—the bar patrons from A New Hope, the Palace revellers and guards of Return of the Jedi, and the bounty hunters aboard the bridge of the Executor in Empire Strikes Back—the Tales books told small stories of love, loss, comedy, despair, and yes, occasionally, the Empire and the courageous rebellion against it. The first three Anderson-edited Tales books. The most fascinating thing about these books was that all these stories featured “insignificant” characters, outside of supporting film characters on the level of Boba Fett or Greedo. They were characters who were on screen for literal seconds, whose names you only knew because they’d gotten an action figure at some point like basically everything and everyone in Star Wars. But the lives they led were those of the scoundrels and grifters, musicians and artists, the ordinary people of the Star Wars galaxy, far removed from the exploits of Han, Luke, Leia, and everyone else. The consequences were small, but personal. When a Tales story did deal with the Rebellion or the Empire, it was in ways that examined them from individual perspectives instead of the monolithic entities they are in the films—telling stories that were about the daily life of fighting in a galactic civil war. Were they tales vital to the fabric of Star Wars? No. Could some of those stories be a bit absurd? Hell yes. But they all made the world of Star Wars feel rich and textured, like an actual galaxy of people and beings beyond the larger-than-life heroes and villains of the movies. It’s texture the current Star Wars canon really, really needs. Sure, we’re getting reams of stories that fill in the gaps of our heroes’ lives, and the events of the films themselves, but about the galaxy at large? Less so. The current Star Wars canon often feels like it’s obsessed with contextualising only what we knew already — and very specifically what we know already about the original Star Wars trilogy — to the point that its galaxy is also far smaller than it should be. What we’re primarily getting are stories about specific characters from the movies, all mostly connected in one way or the other to the various plot points of the films. 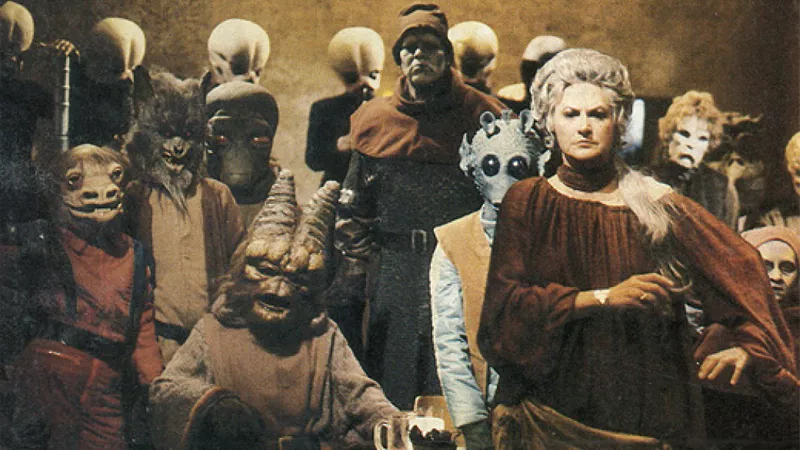 The beautiful, ordinary people of Star Wars, with bonus Bea Arthur, in the Star Wars Holiday Special. It’s getting better, in fits and starts — the anniversary-celebrating From a Certain Point of View gave us a similar sort of anthology, for example, but it specifically tied itself into the events and ephemera of A New Hope, relishing in connections to a story and characters we know and love already. Marvel’s Dr. Aphra book might have been born out of connections to its first (and remarkable) Darth Vader series, but it’s starring an entirely new character and telling a story from the perspective of not a rebel or an imperial, but a gung-ho archaeologist. And it’s not to say that the current canon material we’re getting by the bucketload is bad or anything—in fact, it’s the direct opposite, and of consistently great quality. I just wish that it wasn’t so laser-focused on the characters and events in the Star Wars galaxy we already knew about, and instead gave us more windows into the lives of ordinary people swept up in these grand sagas. More small tales about people, instead of heroes and legends (and Jedi and Sith). We need those stories to make Star Wars feel so much bigger and richer than it does.